After Medicare Drops Screening Charges, Men Head To Colonoscopy Suites : Shots - Health News More older men are getting screened for colorectal cancer since the federal health law eliminated the out-of-pocket charges for screening tests, but there's a catch if polyps are found. 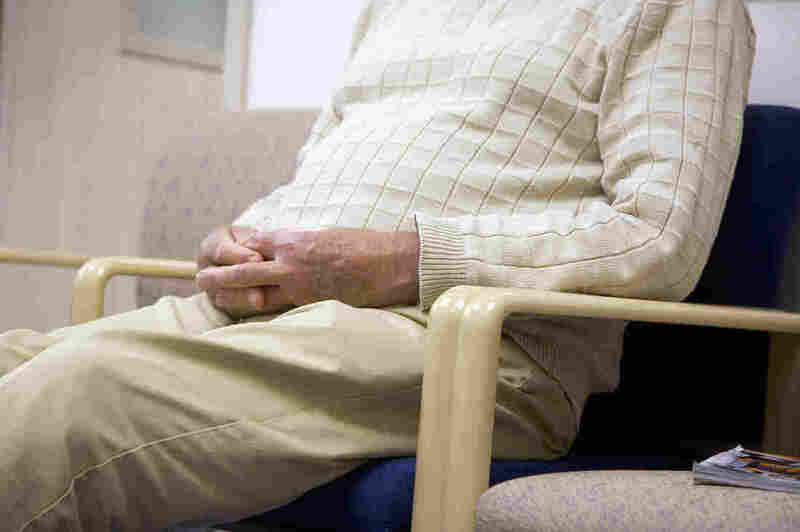 More men are getting colonoscopies to screen for cancer since the Affordable Care Act reduced how much Medicare beneficiaries pay out of pocket for the preventive tests, a recent study found. The change, however, didn't affect women's rates. A study, published in the December issue of Health Affairs, compared rates of screening for colorectal cancer among people age 66 to 75 before and after the health law passed in 2010. Starting in 2011, that law waived the Medicare Part B deductible (which totals $147 annually in 2015) and eliminated the requirement that beneficiaries pay 20 percent of the cost for screening colonoscopies. The data came from the Centers for Disease Control and Prevention's annual Behavioral Risk Factor Surveillance System. The study found that for men, colonoscopy screening rates increased from 18 percent to 22 percent following implementation of the health law. For women, the rate didn't budge, remaining at 18 percent even after the law took effect. The study's finding that women didn't respond to policy changes related to colorectal cancer screening coverage is consistent with other research, said Kandice Kapinos, the study's co-author who is an economist at Rand, a nonprofit research and policy organization. "Maybe they assess their risk differently because they generally have a lower incidence of colorectal cancer than men," she said. There is also some research that shows that women are more likely to say an endoscopic screening test such as a colonoscopy is embarrassing and to opt instead for a blood stool screening test, Kapinos said. Under the health law, services that are recommended by the U.S. Preventive Services Task Force are covered without patients having to pay anything out of pocket. The task force recommends screening for colorectal cancer using stool testing, sigmoidoscopy or colonoscopy between age 50 and 75. Colorectal cancer is the second-leading cause of death in cancers that affect both men and women, according to the CDC. The colonoscopy is considered highly effective as a screening tool because it can locate polyps, most of which are benign, and remove them before they have a chance to become malignant. Screening rates are lower than they should be, however, and only 40 percent of adults are up to date, according to the study. Under the health law, private plans can't charge consumers a portion of the cost if, during their screening colonoscopy, a polyp is discovered and removed. That step is considered an integral part of a colonoscopy. Under Medicare, however, beneficiaries may be charged 20 percent coinsurance in such instances. If a polyp is found, the procedure is then considered diagnostic rather than screening by Medicare. The researchers note that disparity and suggest the elimination of "the remaining difference in cost-sharing between screening and therapeutic colonoscopies could improve screening rates." The American Cancer Society Cancer Action Network continues to urge Congress to make the fix, says spokeswoman Alissa Crispino. Please contact Kaiser Health News to send comments or ideas for future topics for the Insuring Your Health column. Follow Michelle Andrews on Twitter: @mandrews110.